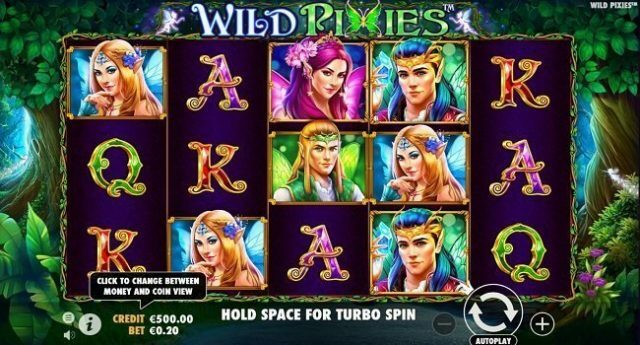 Wild Pixies is 5 reels and 20 paylines online slot game set in an enchanted forest with woodland backdrop powered by Pragmatic Play. Play this slot using your desktop, tablet or mobile with coin sizes of 20 to €£100 per spin. With 2 Bonus Rounds available in this game, you can win a jackpot of 500 times of your stake. This magical fantasy slot game could get you an initial 8 free spins along with multipliers. The reels of the game include some lower value symbols and some higher value symbols. The lower value symbols are A to 9 royal as well as 2 male and 2 female Pixies. The pixie king is the highest paying symbols of this game that will give you 2.5, 7.5 and 12.5 times of your stake for 3,4 and 5 of his symbols. The game also features a wild that pays you 5, 12.5 or 25 times of your stake if you land 3,4 or 5 wild symbol across your payline. The wild replaces all other symbols on board except the scatter. The gemstone is the scatter and it only appears on reel 11,3 and 5 and 3 of these scatters will trigger Roaming Wilds Free Spins feature. The game also comes in with another scatter feature known as Scatter Nudge feature. This feature is triggered when you land scatters only on reel 1 and 3 and not on reel 5. In that case you will hit the scatter nudge yielding Scatter Nudge feature. After activation/triggering of this scatter/free spin feature you will receive 8 free spins. 2 more free spins will also be awarded to you once you activate a pair of roaming wilds. Wild Pixies is a magical feel video slot that could be your game because it is nicely designed, has a great soundtrack and impressive visuals.